Some philosophical work is so profound as to be influential for thousands of years. Plato's 'The Republic' is one such series of dialogues. It explains and explores the relationship between state institutions and individuals, and has provided humanity with lessons in politics, philosophy and individual enlightenment since it was penned some two thousand years ago. One of the central dialogues in The Republic is called the Allegory of the Cave. The lessons the Allegory of the Cave provides to today's world are numerous, and its depiction of our insidious societal structure is extremely accurate and insightful - despite often going unacknowledged as such. Through its exploration of our political outer states, it also explores our psychological inner state as well. The Allegory of The Cave proposes that what people take to be 'reality' in total is only a partial reality, or an all out illusion. It's about how we can ascend from the bottom to stand face-to-face with the golden Sun. "Let me show you in a figure how far our nature is enlightened or unenlightened Behold! Human beings living in an underground cave"�. In the Allegory there are four character types. Most people are chained, forced to watch images on a cave wall. Some however, the second character type, are unchained. They need no force; they are so transfixed with the imagery on the wall that the shadows are all they care about, and remain in the cave by choice. The images are cast on the wall by the third character type, the captors, who use a fire behind them to produce various shadows, to keep the prisoners entertained. The prisoners interpret the shadows and whatever noises are made as reality in total, for it is all they know. The fourth character type is the freed prisoner. The narrative of The Cave hypothesizes what happens after the prisoner is released from the false imagery to which his society is subjected. The story of the freed prisoner goes that, after initial shock and distress, the prisoner learns to distinguish between reality and shadows, and sees the fire producing the shadows. When exiting the cave, he is first blinded by the light but eventually learns the basics of nature. He learns what is real, and what is shadow and reflection. He learns of Earth and Water and that all is dependent on the Sun, seasons and all life. After learning of the true reality outside the cave, free of the false images of his captors, the prisoner is inclined to return and inform those still confined to the cave of their present predicament… with unexpected results. Similarly, the story of '1984' by George Orwell takes place within an imagined dystopian future; the allegorical cavern. The Telescreen, which constantly transmits as well as oversees, is equivalent to the shadows on the cave wall cast by the unseen captors, the Inner Party. Most people in 1984 are Proles; they are equivalent to the people chained in the cave, forced to accept false imagery as their reality. They have been prisoners their whole lives and do not notice the fact they are chained. The Outer party are the unchained, remaining totally transfixed on the party line told by the Telescreen. They are so loyal to the imagery and narrative created by their captors that they will believe whatever they are shown, rather than observe for themselves. They will believe two plus two is five, as the saying goes, as long as it is presented as such on the Telescreen. Moreover the return of the freed prisoner can also be related to the 'return of the prophet' described in many theological constructs. In '1984', Emmanuel Goldstein (Emmanuel = God is with us, Goldstein = gold rock) is a character who figuratively left the cave, or understood the Inner Party's images were lies and attempted to get others to understand the institutional lies. Emmanuel is the supposed leader of the elusive Brotherhood in 1984, and is scorned, even hated by society. His attempt to enlighten his community to its captivity is met with disbelief, resistance and scorn. The character of Winston Smith in 1984 is that of a person who attempts to leave the cave. He is privy to certain Inner Party lies and begins to question the Inner Party line and seek alternate facts and perceptions. Winston's end is not a happy one; akin to the return of the prisoner hypothesized in The Allegory of The Cave, he attempts to leave the cave only to be shut in and beaten down - made to hold the party line by both prisoners and captors alike. Similarly, today, individuals can transmute from dull repetitive 'thought' into ascended golden thinking, but as our minds are freed, one at a time, we ultimately find that our broader society is embedded with a series of norms and structures - of Matrices and Caves - that perpetuate false imagery, preserving the status quo from the 'threat' of individual thinking. Some fictional literature is so profound as to be relevant for decades (and centuries) and serves to expand humanity's language and thought; its understanding of itself. George Orwell's 1984 is one such literary work. It is a post WWII interpretation of the relationship between individuals and institutions, using the archetypal Allegory of the Cave. The Allegory of the Cave, 1984 and The Matrix contain corresponding layers. Each explores a diabolical form of societal control; the control of thought through the presentation of selective information and images, in combination with physical constraints of strict surveillance and imprisonment. Sound familiar? In fact, the original title of 1984 was proposed as The Last Man in Europe. Certainly that is the way many of us feel - as if we are the last lone person - when we first become aware of lies and partial-truths that are presented as reality by those in control, and accepted in totality by seemingly everyone else. 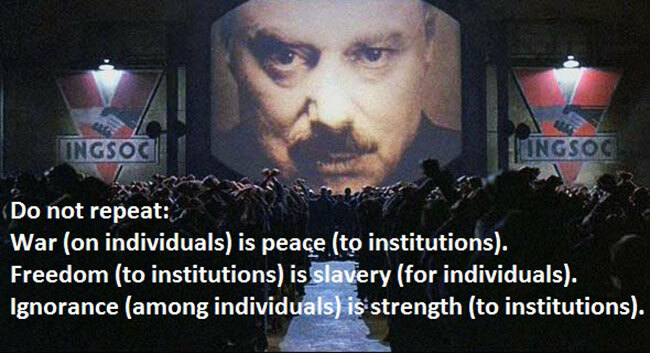 George Orwell's 1984 spawned new language for age-old structures of manipulation presented in the Allegory of the cave - the word "Orwellian" being one among many. This all-encompassing term is reflective of lies made to be truths, unlimited institutional surveillance, and logic so distorted as to not only convince the masses that two plus two equal five, but that war is peace, freedom is slavery, ignorance is strength; and also to deny the very basic elements of nature… Just as we do today. In reality, individual ignorance is strength to institutions. Everyone has their own personal caves and we are all figuratively held in larger societal caverns. Coming up with your own questions is the way get out of the cave and gain enlightenment. Questioning what seems like a lie, or an illusion in the cave, is the first step outside the cave. The solid world exists, its laws do not change. "Freedom is the freedom to say that two plus two make four. If that is granted, all else follows". Click below to listen Ethan discussing the Allegory of the Cave, and much more, with Janet and Sasha on the Planetary Oligarchy series on Aquarian Radio.